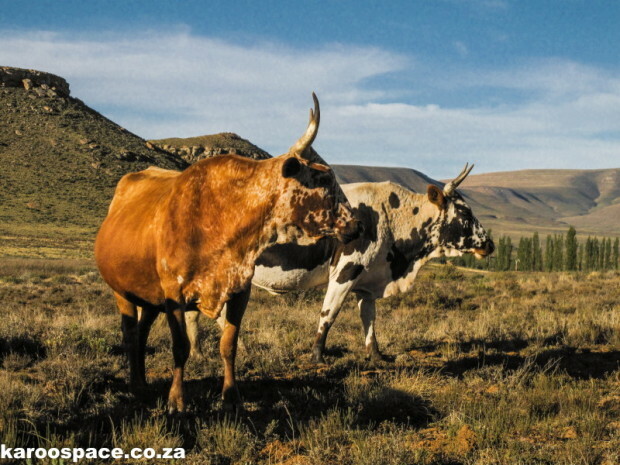 If you’ve ever dreamed of a farm in the Karoo, and better still, one that allowed you plenty of leisure, family time and long cups of coffee on the stoep, consider Nguni cattle. Kevin Watermeyer of Zuurplaats farm outside Nieu Bethesda made the switch from sheep to these hardy beasts in 1997. Farming with Ngunis has been a revelation to him, a fifth generation Karoo farmer. A herd of Ngunis coming down to water. “Our cattle are raised on the veld. There’s no dipping, no kraaling, no steroids, no hormones, no hassling about predators, no feedlots. In fact, the only input costs are eartags and natural rock salt licks. “Since 1991, we’ve used no chemicals on the cattle whatsoever and since we’ve had Ngunis, I haven’t ever stuck a needle into a beast. It’s good for the environment and quite honestly, it’s good for the bottom line. He also prefers them because “a sheep grazes a plant right down to its roots. Whereas cattle, with their broader mouths, always leave something. “There wasn’t this grass cover here eight years ago. And as a result, the rain isn’t running off so fast. It penetrates, and the groundwater is higher. 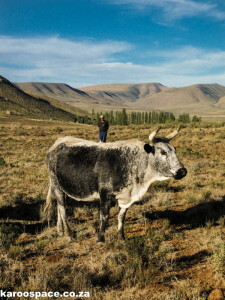 To Kevin, the drought-hardy, disease-resistant Nguni is the ideal animal for the grassy eastern Karoo. There are plenty of calves – and that’s the main advantage of owning Ngunis. They are far more fertile than any other breed, giving birth quickly and easily. So now we move onto the real nitty-gritty, the reason why some cattle farmers look down on Ngunis and their relatively light weights. “Why don’t you just fax your cattle to the abattoir?” they taunt. This is the reason indigenous breeds are the fastest growing of all at the moment, says Kevin. It’s why Ngunis are now the second largest registered herd in the country. And their smaller carcasses are perfect for rural abattoirs. Ngunis get good prices at stockfairs. On Bloemhof farm north of Graaff-Reinet, Julian Murray is slowly getting rid of his sheep and bringing in Ngunis instead. He finds they make more sense because these cattle aren’t readily picked off by the predators that find sheep such an easy target. 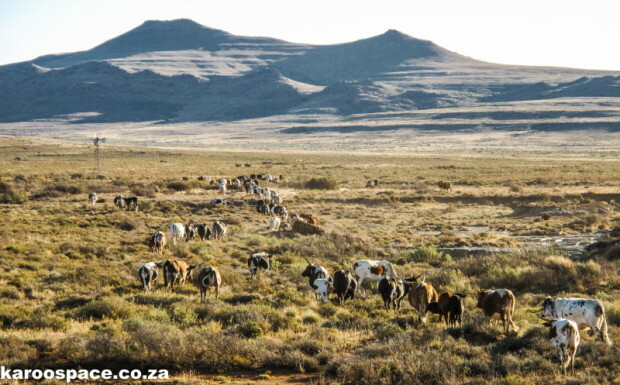 And just in case there are any last doubts on the suitability of Ngunis in the Karoo, historians have found references to Sanga cattle (ancestors of Ngunis) being farmed in this region as far back as the 1750s. Kevin Watermeyer and his lovely Compassberg Ngunis. I loved the article. 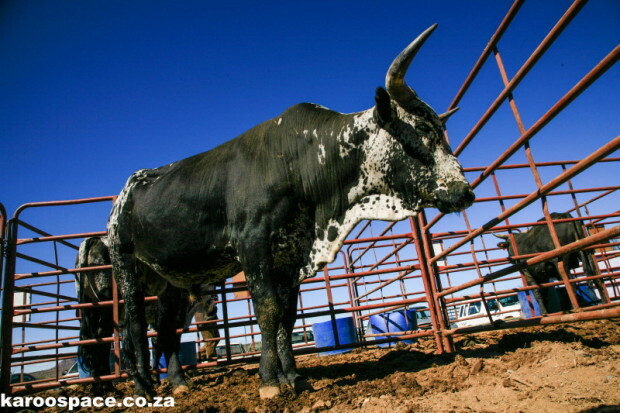 Although I have read a bit about southern African indigenous cattle breeds, as well as those developed by breeding, I found this short story about the Nguni so fascinating. 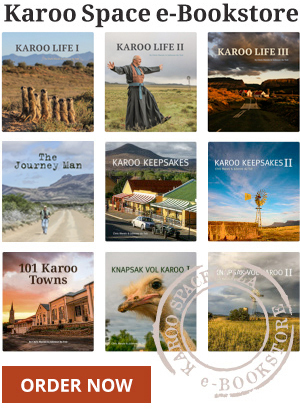 I appreciated the pastoral photographs of the Karoo too. i loved the article. i want to try my luck with Nguni goats and sheep on a small scale in Limpopo. i would appreciate advice in this regard. I plan to start in February. What a delight to read this. It seems people are slowly coming around to the fact that you have to work with the environment not against it. Better for everyone. So good to see the pics of home and old friends (Kevin:)). Nieu Bethesda and surrounds is indeed a special place.